by Lana After leaving Alden's very plain and boring, yet irritatingly perfect-sized Joe Fresh lunchbox behind somewhere in Ottawa, I've been hunting for a replacement lunchbox. I figured that with Joe Fresh selling peacoats in July they would also have some back-to-school lunch boxes by August. Not so. (Or at least, not at the Baseline/Woodroffe Loblaws.) The other grocery stores options included a $15 super fugly cooler bag or girly Elle lunch sac. No no no. No. I started searching around online for some stylish lunch boxes. And wow - there some kyuuuute lunch boxes out there. Ultimately, I let my wallet decide and chose the very cute owl Zoo Lunchie by Skip Hop ($16). The boy flipping adores it. He carried it around the house all evening, waved and yelled "bye bye." He was ready to hit the road and leave mom and dad at home in the dust. It was a major toddler win. He clutched it in his stroller all the way to daycare today too. It would be the perfect lunchbox except... it's about an inch and a half too small. Duh duh. 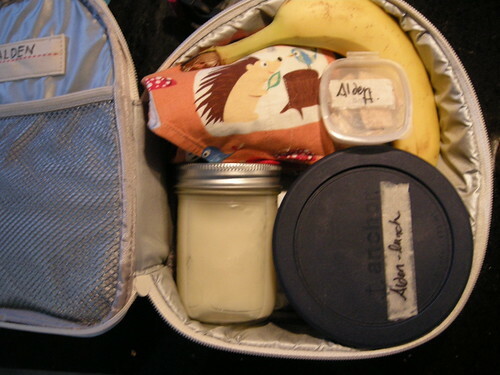 You see, I need to pack a main dish for lunch, drink and two snacks each day and it's a pretty tight squeeze once you add in a drink container and a main dish container. Maybe I'm meant to have a separate thermos for the drink or perhaps use baggies instead of containers. I'm not sure. All I know is that that it's just slightly too small for my toddler's daily food rations. Sigh. Boys. At this point, I'm not sure what to do. 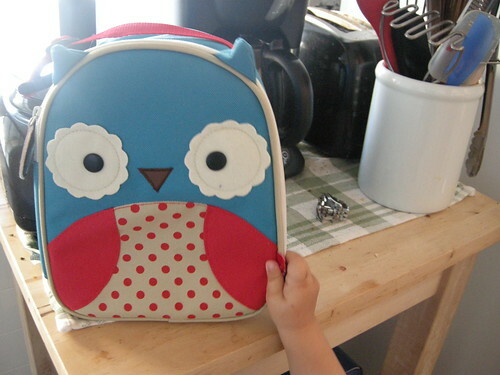 Order another lunch bag or keep trying to cram everything into Mr. Owl. Beatrix Lunch Box (available at Raspberry Kids): $37. Yes, $37 for a lunch box. Outstandingly cute. Expensive. Goodbyn (available from many different online shops in Canada) : $35. I like this a lot, but I needed something that could accomodate small containers. BuiltNY Munchler $14 - Major cute points, but decidedly petite. I could see using this for short outings. And I ADORE the built-in placemat. Lunch Boxes for Kids - Cute, understated and great for my lunch. But linen + toddler = nightmare. Also, it looks small. Neoprene lunch bag $36 - I still love this one. I regret not buying it. I think the size is probably perfect for my needs. Washable and non toxic. Darn. Next stop: Regret City. Lana is a knitter, veggie gardener, wife and toddler wrangler. She can be found blogging about cooking, baking, gardening and more on her blog, Apron Strings.